Rolling a blunt will never be the same again. Discover it at our Flagship Store! Cool Pull technology gives you a smooth hit. The screw cools down smoke by doubling the length of the smoke path, giving the augur more time to absorb heat. The heat sink and path lengthening properties of the screw contribute to a 30% cooler hit. Fresh hits all day long! Archimedes would be smiling from his grave for our clever use of his screw. Just turn the mouthpiece and fresh herbs are pushed forward, ready for glorious combustion. Be sure to learn the 'Lighter Tricks' method for ashing. We take our reputation seriously. When it comes to materials, we only use the most expensive and pure metals. Our proprietary titanium coating has six layers, each serving a vital purpose in our engineering. We use laboratories accredited by the US Consumer Product Safety Commission to test all our products. We also voluntarily test for and exceed the standards set by European Union RoHS standards for Restriction of Hazardous Substances. Glass breaks. It's a fact of life, but don't worry, get to our flagship store to order replacements anytime. 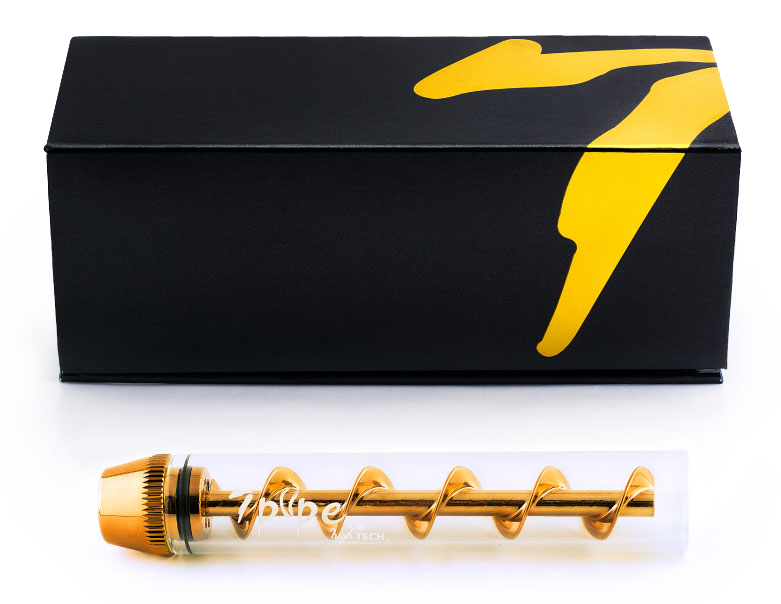 Or better yet, just order our TwistyTM Combo Pack to get two spare glass tubes included, as well as a zipper carry pouch to carry it all conveniently.